It’s not too late for your team to attend the 2015 Diploma Planning Institute (DPI), an opportunity for teams of school and/or district administrators and personnel to meet and work on their dropout prevention plans, with guidance from NDPC and a team of experts. DPI’s goal is to help schools develop customized, practical, and local plans to lessen dropout rates and increase graduation rates. Plan on bringing your team to Mississippi later this month. 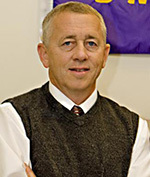 Visit http://dropoutprevention.org/conferences/diploma-planning-institute/ to register or for more information. Save the dates for the following events and stay tuned for more information and calls for proposals to present. If you need information before then, you may contact us at ndpc@clemson.edu and we’ll be glad to help. 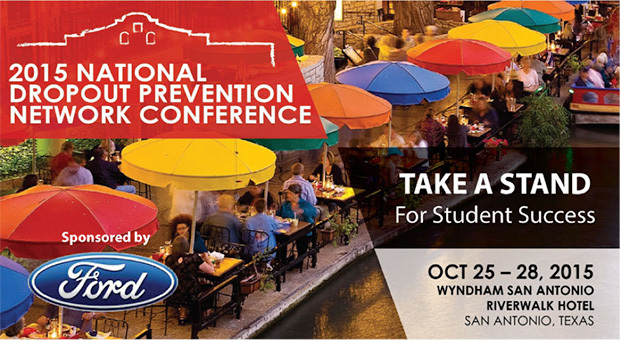 The call for proposals to present is open at www.dropoutprevention.org/conferences/2016-at-risk-youth-national-forum/. We’ll let you know when registration and an agenda are available, or you may check the Web site for updates. If you work with or on behalf of youth at risk of dropping out of school, you’ll want to enroll in our National Dropout Prevention Specialist (NDPS) certification program. The certification will verify participant knowledge and expertise in at-risk youth issues and strategies for raising graduation rates. The NDPS certification program is founded on NDPC/N’s research-based effective strategies, known youth risk factors, professional learning participation, and field implementation of acquired knowledge. If you are accepted into the program, you may begin work immediately at the very next NDPC/N conference or event. Contact us or link to this Web page for more information and to join our NDPS army of practitioners across the nation who are officially becoming better informed and networked, as well as recognized, in their fight to end the school dropout crisis. In the September 8 Solutions to the Dropout Crisis program, Dr. Joseph Hendershott, founder of Hope 4 the Wounded Educational Seminars, focuses on how to reach the “wounded” student: that student suffering from the deep scars of emotional, physical, and/or mental pain. “Reaching the Wounded Student” will focus on how to identify a wounded student, how to recognize different types of trauma, how wounds can be manifested through a variety of antisocial behaviors, how to reach a wounded student and leverage teachable moments to teach and/or reinforce acceptable behaviors, and how alternative discipline can achieve key outcomes for both student and teacher that lay the groundwork for effective teaching of marginalized students. Link here on the day of the broadcast to join us for this program. Viewing this webcast is free and no registration is required. Tune in the second Tuesday of each month at 3:30 PM ET for new Solutions to the Dropout Crisis. As always, archived programs may be viewed at your convenience at www.dropoutprevention.org/webcast/. A book recommendation coming from NDPC/N Fellows is Latino Dropouts in Rural America: Realities and Possibilities, by Carolyn Hondo, Mary E. Gardiner, and Yolanda Sapien (SUNY Press March 2008). The book shares stories of Latino high school dropouts from rural communities in Idaho and presents a recommended leadership plan to help educators understand the lives of rural Idaho youth and to critique their own schools. This monograph tells the story of a rural county that came together to address collectively the dropout problems facing their school district. With careful analysis of the educational needs of the community, this community collaboration resulted in implementation of a comprehensive dropout prevention plan. Their story provides others with a powerful model for success. For the month of September, this book is being offered at half price ($5.00 for non-Network members and Network members). 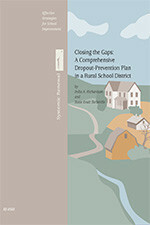 To order this book, visit www.dropoutprevention.org/publications/page/2/. For more information on becoming a member of our National Dropout Prevention Network, visit www.dropoutprevention.org/membership. The newest in a series of National Center for Educational Statistics reports on Trends in High School Dropout and Completion Rates in the United States is now available and covers the years 1972-2012. While anti-bullying curriculum may have created a generation more aware of and intolerant of blatant and stereotypical bullying, a U.S. News and World Report health blog states that young people are being bullied in more subtle, but perhaps even more dangerous, ways. The article highlights a troubling practice of peers bullying peers to skip lunch at school. Read the story here. New Mexico Governor Susana Martinez announced steps to improve academic outcomes and keep more young people in school and on track to graduation, including online tutoring services and a grant process to provide dropout prevention coaches and social workers for middle and high schools across her state. Read the story in the Ruidoso News. See how strategy walks, tapping into colleagues’ best practices, PLCs (Professional Learning Communities), supporting teachers, and high expectations made huge differences at Lehigh Senior High School in Florida. Watch the video. Michele Molnar, of Education Week Marketplace K-12, brings our attention to a recent study by two economists showing that if all students achieved a minimum level of basic skills, their increased earnings as adults would add $28 trillion to the U.S. economy over those students’ lifetimes, and repay the entire investment in K-12 education. And that may be a considerable underestimate of the value of educational reforms. Read the report, Universal Basic Skills: What Countries Stand to Gain, which was released in May by the Organization of Economic Cooperation and Development (OECD) and authored by Eric Hanushek (Stanford University) and Ludger Woessmann (University of Munich). Alan Neuhauser, energy, environment, and STEM reporter for U.S. News & World Report, reported on a recent STEM Solutions Conference in San Diego, citing experts who say that giving students the opportunity for workforce exploration—and blurring the boundaries between academic education and technical training—can not only help shepherd more workers to technical fields, but also make sure they have the science, technology, engineering, and math skills companies say are sorely needed. Read the blog here. This year’s annual Building a Grad Nation report, produced by Alliance for Excellent Education, America’s Promise Alliance, Civic Enterprises, and the Everyone Graduates Center at Johns Hopkins University, states that while it is estimated that 85%-90% percent of students with disabilities could meet regular diploma requirements with the right supports, the graduation rate for this group of students was just 61.9% in 2012-13. This compares with data showing that the on-time graduation rate of the U.S. could very well reach 90% by 2020. Nationally, students with disabilities make up approximately 13% of all public school students, so concentrating on that group of students could have major impact across the nation. We appreciate comments from our readers. We invite new subscribers to receive the Dropout Prevention Update via our Subscription Sign-Up, or via email to ndpc@clemson.edu with the subject line “Subscribe to Update Newsletter." Copyright ©2015 National Dropout Prevention Center/Network. All rights reserved.